October 15, 2015 23:45 | Interviews M.I.C. This year’s Dimensions Festival in Croatia was truly magical. Drawing together many of the world’s taste-makers, pioneers and living legends created a true feast for the senses, crowned by Sunday night’s epic finale with George Clinton / Parliament / Funkadelic headlining The Clearing stage to a packed and rapturous audience. The revered p-funk and soul collective brought their amazing live show to Croatia as one of the biggest bookings the festival had seen in a simply sublime night of music under the stars. Earlier during the festival, at The Knowledge Arena, George took part in a deeply candid, insightful and enchanting talk hosted by Tony Nwachukwu, and with George’s blessing the interview was filmed exclusively by Dimensions. The incredibly intimate setting created a magical hour in which George recounted a wonderful odyssey joining the dots between his career’s hugely esteemed body of work. 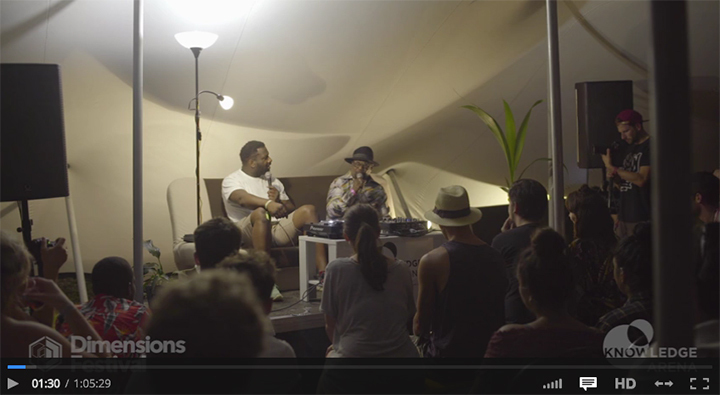 The Knowledge Arena at Dimensions – and Outlook Festival too – really came into its own this year, with workshops, showcases, key note talks and in-conversations with iconic artists performing. This summer The Knowledge Arena offered everyone a rare chance to be up close and personal to true musical legends, as well as being able to experiment with the latest technologies in music production.